Segmentation is an essential developmental process in arthropods that involves the formation of body segments with different functions. In insects, this happens in two ways—either all segments are made almost simultaneously, or a few segments at the front of the body are specified, such as the head, and then posterior segments are added afterwards, which is similar to what happens in most other arthropods such as spiders. 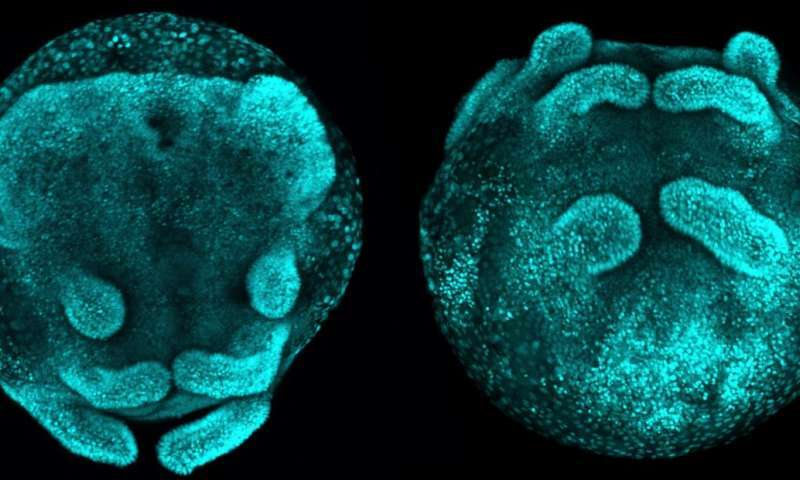 "We have a detailed and growing understanding of the regulation of segmentation in various insects, but previous studies have shown that some different genetic mechanisms are used to generate segments in spider embryos," says lead author Christian Paese, Ph.D. Student in the Evolution of Animal Development and Morphology Group at Oxford Brookes University, UK. "In insects, the SoxB gene, Dichaete, is involved in segmentation. Having identified a family of Sox genes in the spider Parasteatoda tepidariorum, we wanted to see whether they also play a role during segmentation in these animals too."